I read this article and found it very interesting, thought it might be something for you. The article is called Anger In Coal-Rich Orissa District Reflects India’s Flawed Mining Policies and is located at https://archive.indiaspend.com/investigations/state/anger-in-coal-rich-orissa-district-reflects-indias-flawed-mining-policies-99723. Chhendipada (Odisha): It was just after 7 a.m. on Thursday, September 4 when the first marchers—men, women, youth, children—streamed down the street, into view. 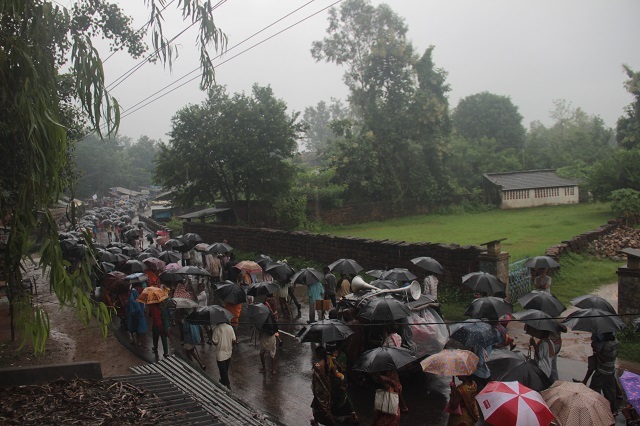 As dawn’s drizzle turned into pouring rain, the slogans rose to a crescendo through a canopy of black umbrellas. Chief Minister Naveen Patnaik, and Prime Minister Narendra Modi were targeted too. “Modi used to sell tea, now he wants to sell us to Adani”, one man hollered. “Give us land, if you want to take our land,” chanted a gaggle of women farmers in bright sarees and rubber slippers. As your correspondent took photographs, she was periodically asked: “Are you with us, or with the company?” It was a reflection of deep mistrust of the media among villagers, who alleged local journalists were routinely bribed by industry and did not report their side of the story. The mutinous crowd turned into the open ground, framed against distant, blue hills. This was the bucolic site of an environmental hearing for a proposed coal mine, called by the administration in Chhendipada town, in the forested, mineral-rich Angul district of central Odisha. More than 600 tense, but unusually restrained, police personnel and home guards—deployed at the ground since dawn with rifles, batons, tear gas and protective gear—looked on. The protestors started taking apart the rickety stage that the security forces were protecting. Some wrecked the loudspeakers, then the blue and red plastic chairs. Others dismantled the bamboo boundaries, erected to separate the officials from the locals during the hearing. Men and boys carted off these poles through the mud and slush. This done, the crowd turned its attention to district officials and individuals, rumoured to be company representatives, who were attempting to leave, escorted by a tight ring of police. Faced with this unyielding crowd, the district official weakly declared that the hearing was cancelled because the villagers were opposed to it. Loud cheers broke out. It was now 8.54 a.m., more than 90 minutes before the hearing was to officially begin. Resource conflicts are an intensifying and under-acknowledged phenomena across the coal-rich farms and forests of central and eastern India – a mineral used to generate over 60% of India’s power. Few urban Indians know or think about these pitched battles unfolding almost every month in rural, often remote, areas of their country. First, cities and towns will need more energy than ever before to meet growing demand, a fact brought home time and again by power shortages and blackouts, the most recent, a power failure across Mumbai, a city where the electricity always stays on, and news of tariff tussles and fuel shortages. Second, the conduct of the state and businesses in rural areas is key to reforming discredited public institutions and processes, and to creating an accountable policy regime around natural resources. Take for example the proposed coal block, for which September 4’s environmental hearing was first called, after ignoring intense protests, and then reluctantly abandoned—the third time this has happened in as many years. Located in Angul district, home to one of the country’s largest coal deposits, the proposed coal block contains an estimated 12 million tonnes of coal and a life of 48 years. The mineral lies beneath 7,500 acres of a thriving agrarian economy across nine villages. These are home to more than 10,000 people, whose education and relative prosperity put them in the rural middle class, with capabilities and resources to assert their rights. The tract was marked out as the Machhakata Coal Block by the Ministry of Coal, one of several coal blocks created in this area, and was allotted in 2006 to MahaGuj Collieries Ltd, a public sector power company jointly formed by the Maharashtra and Gujarat state governments. As has been the case so often, rural India’s forests, farms, mountains and water bodies have to make way for open-cast mines to fuel urban India, with little attention paid to the corruption, conflicts and injustices these transitions produce. As the accompanying graph shows, millions of Indians have been displaced by industrial projects, but there is no reliable record of these displacements. The Ministry of Tribal Affairs, for instance, in displacement data from 1999-2013 says that 665,131 people were displaced across India. But when IndiaSpend totalled up the figures for only 11 states, it added up to 840,703. Also, states like Bihar, Gujarat and West Bengal are not included in the list from this source. *In a 2007 paper, academic Walter Fernandes estimated the number of Indians displaced between 1947 and 2000 to be 60 million (other estimates put it at 65 million), with 5 million of these displaced by mining. Citizens living on India’s margins comprise the bulk of our displaced – for example, adivasis or tribals are 8% of the population, but make up 40% of the displaced, according to the Planning Commission’s 12th Plan document. The graph above uses some state-wise estimates from Fernandes’ paper, which does not include data from the mineral-rich areas of Maharashtra, Madhya Pradesh and Chhattisgarh. In 2010, Mahaguj signed an agreement with the Gujarat-based Rs 47,000-crore industrial conglomerate, Adani Enterprises Ltd, to mine the coal. The details of the deal have not been shared with the villagers whom the state is trying to evict. Neither is Adani mentioned in public documents like the mine’s Environmental Impact Assessment report, released for the September 4 hearing. The company’s response to phone calls, texts and an email from IndiaSpend was that its officials were travelling. Ten days later, there was still no reaction. 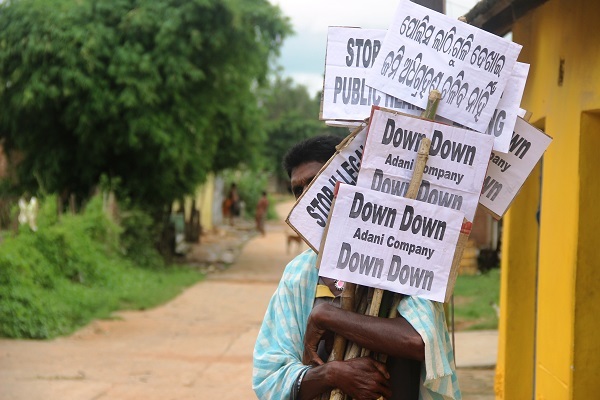 Adani Enterprises—deeply linked in local perception to Prime Minister Narendra Modi, since he campaigned in its aircraft during elections this summer—is now the prime target of local protests, closely followed by IDCO – the Odisha government body with a violent track record of acquiring land from farmers for industry. In conversations, villagers also brought up the bloody fate of other displaced communities in the district, seeking rehabilitation from mining corporations (Warning: Video contains graphic violence). Anger in the area was equally directed at the administration and regulatory authorities. In recent times, apex court rulings and enquiry commission findings have outlined how in the complex policy arena of natural resource governance, authorities have consistently undermined public interest, and depleted the public exchequer. But there is little attention paid to the fates of protesting rural communities, who have borne the brunt of this misconduct. In the villages earmarked for erasure, residents were quick to point out that the coal block that would displace them was among the 218 allotments declared “arbitrary and illegal” by the Supreme Court on August 24. These blocks had been allotted beginning 1993, when the state wanted to involve the private sector in mining, for power production and other captive uses. Hearing public interest litigation, the court held that the allotments “followed no fair and transparent procedure, resulting in unfair distribution of the national wealth”. The eventual fate of these allotments will be known in the coming days, when the court gives its final ruling. In another village, a school teacher, who declined to be named since he had a government job and feared retribution, displayed a letter from 24 August addressed to the state’s Pollution Control Board, the body in charge of environmental regulation and hearings. Signed ‘Villagers in Machhakuta Coal Block’, the two-page letter described problems with the Environmental Impact Assessment (EIA) report for the mine. The teacher said he wondered why board officials routinely accepted faulty reports from distant, industry-commissioned consultants but never paid attention to contrary evidence offered by villagers about the lands they lived in. What rankled residents most was the fact that the EIA did not mention, let alone assess, the fact that the 7,500 acres of agricultural and forest land to be acquired for the proposed mine currently provided the 10,000-odd residents of the area with year-round food, work and income, which the coal mine would end. 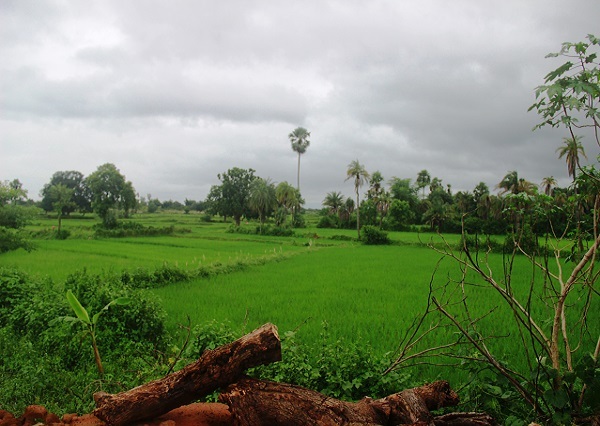 The area abounds in lush paddy fields; sesame, pulses and mushroom are also harvested. On a March visit, villagers had pointed out sprawling fruit orchards and vegetable farms. The EIA’s omissions were further proof to locals, if any was needed, that in the eyes of the state and corporations, costs incurred by rural citizens did not need to be accounted for while clearing projects. The new NDA government has barely acknowledged this deep absence of trust between government institutions, corporations and citizens in India’s mineral-rich areas. Since taking power in May, it has instead moved to quicken mining and industrialization, with a focus on altering laws to shut out the voices of rural Indians from decision-making. For example, the Ministry of Environment and Forests (MOEF) has decided to do away with the requirement of public hearings as part of the environmental clearance process for some projects, such as mines seeking expansion – a move, which was begun by the UPA government towards the twilight of its regime. As a recent Amnesty alert suggests, on the ground, communities will experience these changes in the form of renewed state excesses and violence against them. The MOEF is also devolving clearances for other projects to state governments, even though their regulatory capacity and intent is suspect. According to two senior bureaucrats your correspondent spoke to in recent weeks, there are also growing demands on the Ministry of Tribal Affairs from the Prime Minister’s Office and the MOEF to drop the requirement of consulting gram sabhas, or village councils, before forests are cut down for mining and linear projects – currently mandatory under the Forest Rights Act. Similarly, one of the first things Minister for Rural Development Minister Nitin Gadkari did on assuming office was to begin work on altering the new Land Acquisition act. The new law came into effect this January, replacing its colonial-era predecessor, which was in force since 1894. The note prepared by Gadkari’s officials proposes that gram sabha consent and social impact assessment provisions in the new law be diluted, and the list of exceptions to the law be expanded. As Machhakata’s protests suggest, rural Indians inhabiting resource-rich areas are increasingly hard to silence, or subjugate. In Prime Minister Modi’s grand vision of development, they will have to be engaged with greater democracy and dignity, not less. Note: This story has been updated to reflect the lack of a response from Adani Enterprises, 10 days after phone calls and an emailed questionnaire. Graph Source: Fernandes, Walter. 2007. “Mines, Mining and Displacement in India,” in Gurdeep Singh, David Laurence and Kuntala Lahiri-Dutt (eds). Managing the Social And Environmental Consequences of Coal Mining in India. Dhanbad: The Indian School of Mines University, University of New South Wales and The Australian National University, pp. 333-344. This piece looks like written by some mao sympathizer, although I personally support this protest ! And you seem to be a Namo AndhBhakt! Gifting away green and fertile farm land to industrialists like Adani is really objectionable. Farm land is the life line of our farmers.